inside workplace wellness: Got Grit? I recently wrote a post about willpower and how my thinking had evolved from my theory that one's willingness to tolerate discomfort had a lot to do with whether or not a person exercised routinely, to thinking about self control as an exhaustible resource, to thinking about willpower. Willpower is defined as being able to resist your own natural impulses and to focus your energy on the task at hand. I'm currently reading Drive and they introduce the concept of grit being and indicator of success. Grit is defined as perseverance and passion for long-term goals. Maybe it's not just willpower we need to make a healthy lifestyle change. 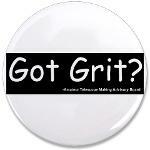 Maybe we also need grit. Now I'm thinking you need willpower to make a change -- start a new diet or an exercise program -- but once you get some momentum going, you need grit to sustain the change and make it part of your lifestyle. From what I've read, you can't just apply grit to any random endeavor though. You have to see how your actions bring you closer to a long-term goal that you're passionate about. There is a Grit Test on the University of Pennsylvania's Authentic Happiness Site. It's 22 simple question and only takes a few minutes to complete. Unfortunately, it takes a minute to register with the site to get access, but it's worth doing. I hope you'll take the test and let me know what you think.